Transporting your wedding party guests to a different place and time is always an exciting adventure! And few are as tantalizingly challenging as putting together a celebration straight out of the “Arabian Nights.” There are so many magical details that can be brought to the scene that, while it may be exciting, it could also feel quite intimidating. That’s the reason we can’t wait to share our styled shoot with you! In it, we present ideas for a Middle Eastern-inspired reception—complete from the welcome display, to the table settings, to the food and drinks, to a lounge area. If we had three genie wishes for this, they would be: to inspire you, to challenge you, and to encourage you to re-create such an event yourself! Note: this is part II of an Arabian Night’s bridal shower theme. 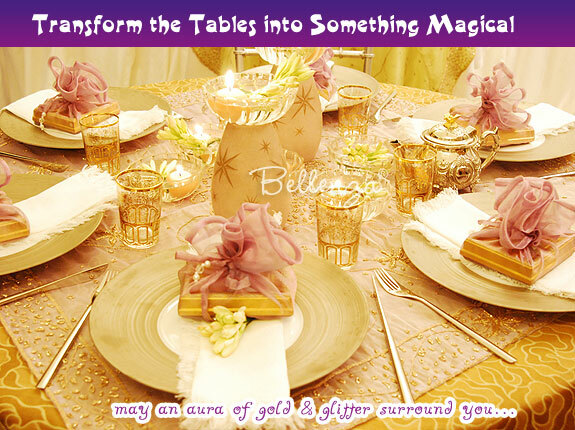 1 – Welcome table – Usher guests into the party venue with a fittingly enchanting welcome table! Lay out a gold embroidered and beaded shawl as a table cover, topped with a fabulous glass and brass lamp and an ornate welcome sign. 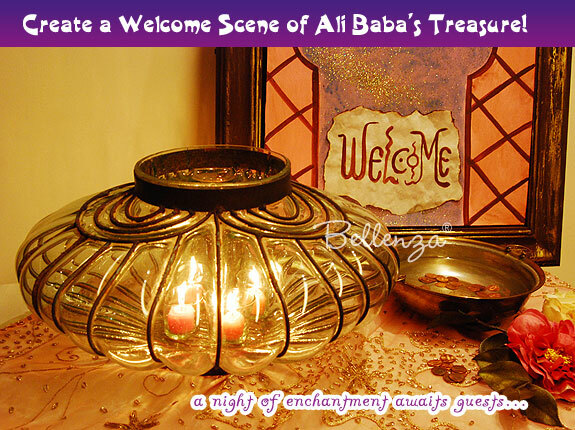 Then, complete the look with fabric flowers and a brass bowl holding coins “from Ali Baba’s treasure”! 2 – Guest book alternative – On the same table, have a creative alternative to a wedding guest book—like this scroll made from gift wrapping paper cleverly discolored and torn to appear aged. 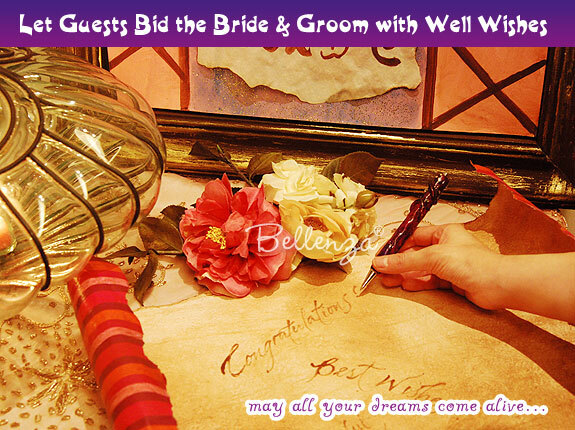 Provide a fancy calligraphy pen and bottle of ink for guests to write their wishes and greetings for the bride and groom. 3 – Glittering tablescapes – Gasps of delight! That’s the reaction to aim for as you prepare your reception table settings. Create an aura of gold and glitter for the entire scene—from the table linens, the china, the glassware, the candle accents, even the gold frame favors with pretty wrapping on each plate. 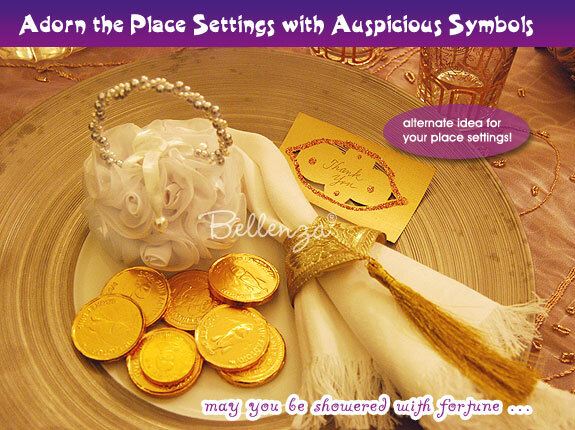 4 – Arabian Night’s Favors – Consider another captivating take on an “Arabian Nights” place setting. Fashion a napkin adornment out of richly-textured gold ribbon and a silk thread tassel. On each plate, present guests with favor sachets, finished with fancy gold favor tags and a scattering of gold chocolate coins. 5 – Lounge area – As guests lounge on the comfy pillows and rugs, keep the late night bonding going with kebabs, dried fruits, and nuts accompanied by more mint tea or wine. 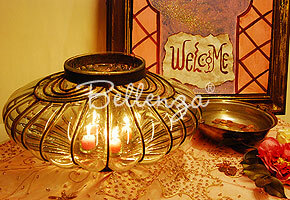 Add to the authentic look with mosaic platters and beaded glass lanterns. 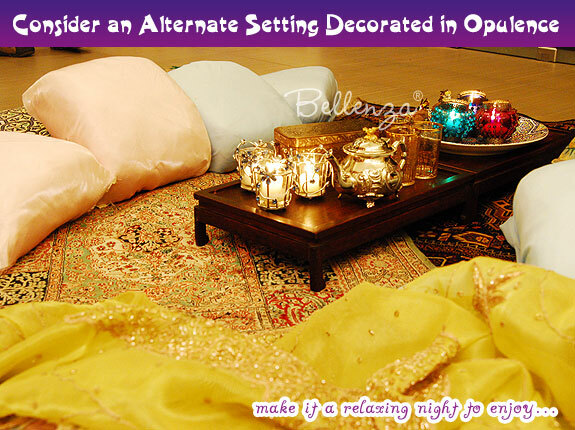 6 – Opulent comfort – If your wedding reception is held in a private home or a function hall in a hotel, you may indulge in a lounge area inspired by an opulent harem! Guests who choose to linger on till the wee hours of the morning can relax on the over-sized floor pillows laid out on rich Persian rugs. 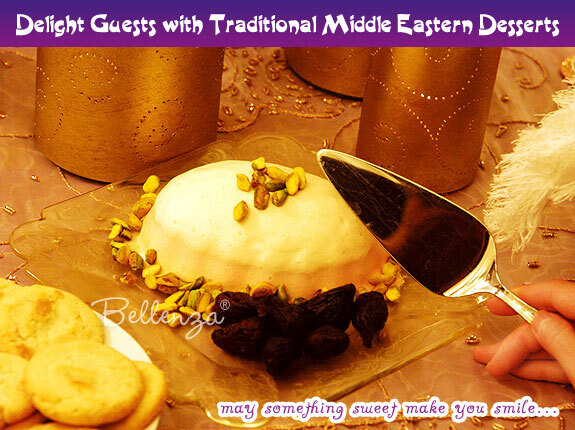 7 – Exotic treats – Delight guests with traditional Middle Eastern desserts, like this creamy dessert pudding flavored with rose water and almonds, then topped with chopped pistachios. You can also serve dried dates and figs, almond cookies, and the popular delicacy baklava. 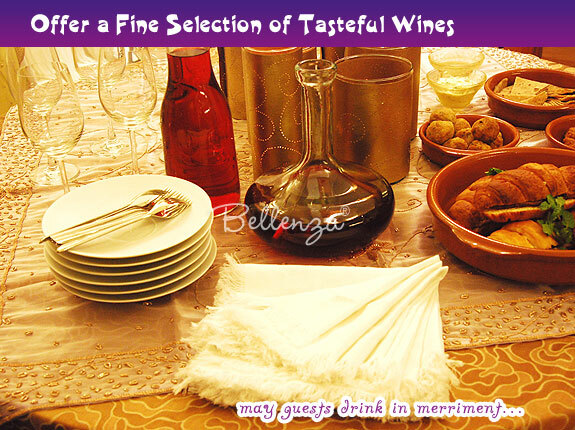 8 – Refreshing drinks – Aside from the traditional mint tea, offer a selection of wines to go with the flavorful menu. Present these in interestingly shaped carafes and decanters to add to the impressive display—accompanied by a grouping of gold-paper luminaries. 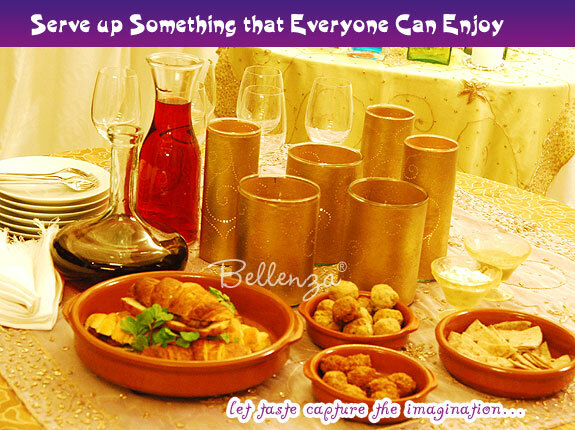 On another side table, set up a buffet of light dishes known as “meze” (savory appetizers) for guests to enjoy. Popular choices would be falafel (chickpea patties or balls), and the famed dips called baba ghanoush (eggplant mousse) and hummus (chickpea and sesame seed paste) served with wedges of toasted pita bread. 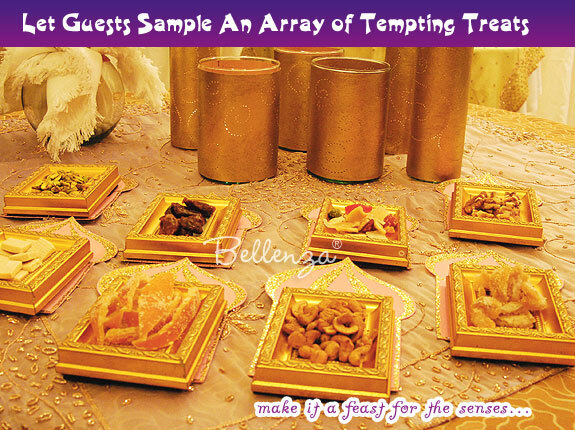 9 – Tempting treats – While waiting for the meal to be served, invite guests to sample an array of tempting appetizers—served on gold frames used as mini trays! The selection could include dried apricots, dates, figs, roasted cashews, pistachio nuts, candied orange rind, and slivers of cheese. 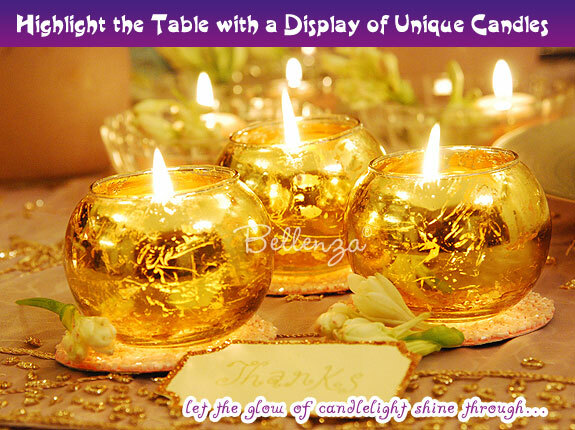 10 – Candles everywhere – Capture and reflect all that glittery gold on the scene with candles, candles, and more candles. One of the many stunning options you can apply would be faux brass mini-globes used as votive holders. Or add jewelled candle holders to the tables. Notice how the scratches and cracks in the finish enhance the exotic look while letting the glow shine through! Create a golden aura for the reception tables—beginning with the table linens, to the china and glassware, to the candle accents, to the guest favors. On separate side tables, offer guests Middle Eastern appetizers—from nuts and dried fruits to traditional dishes called meze—as well as wines in decorative serving containers. If your reception is in a private home or hotel function room, prepare a harem-inspired lounge area for lingering guests—complete with oversized throw pillows and Persian rugs. Throughout the reception, keep piping hot mint tea on hand in authentic tea service sets (ornate silver tea pots and gold-etched tea glasses). 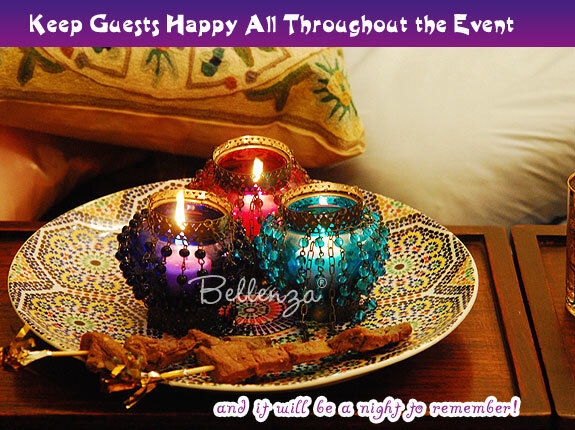 And don’t forget to serve some fine Arabica coffee for your guests to enjoy through the wee hours of the party! How fabulous is the Middle Eastern-inspired decor at this real wedding held in Leicester City, U.K.—found on Rose Parsons’ wedding photography blog? The couple took full advantage of the ornate and exotic decorations to play up the theme—Moroccan lanterns, colored votive holders, even a Casablanca mini poster. While jewel-toned fabrics dressed up the tables, the place settings, and the chairs. Like being transported to a different world! You ladies do Moroccan themes pretty well! I love the mix of glass, glitter and gold. All different reflective surfaces… very cool. Thanks so much, HiLLjO! This kind of theme is really fun to pull together because of all the decorative details that can be brought in. We also tried to put a different spin instead of the usual bold colors by using, as you said, “glass, glitter and gold”! I love this theme! I’m having it for my sweet 16th b-day party. So cool! Love this! How perfect would this be on a hot summer evening under the stars! Thanks so much for your sweet comments, Geraldine, Chrissy (The Perfect Palette), and Vanessa! This theme has been pretty popular for celebrations recently. I’ve been really amazed about your wedding reception table settings within the “A Dazzling Arabian Night’s Wedding Soiree to Remember” slide show gallery, and I was wondering if it’s possible to purchase this kind of decoration in your company. If not, may I ask you to re-direct me to the appropriated stores (web or not) to get that kind of products? Upon searching for arabian nights theme party, I never thought I could find like this, it’s really amazing I love it. My youngest daughter will celebrate her 18th birthday this Oct. 31. Hope all items are available in a reasonable price and available in the market of every country. Hi, Rachel — So glad you like our decorating ideas! Most of the decorative pieces for this theme we found on ebay or in thrift shops and flea markets. Hope you’ll have enough time to do some “hunting” of your own before your daughter’s celebration. Hi Simi — So glad that our set has inspired you! Since you mentioned that you’re planning this theme for your daughter’s 1st birthday, you need not worry too much about sourcing authentic decorations. As you can see from our set, the trick is to use vibrant jewel colors (fuchsia, purple, orange, aqua) and lots of gold and glitter. And you can do this using inexpensive supplies from crafts stores, like colored crepe paper, metallic stickers, sequins, beads, and gemstones. To simulate the look of ‘tents,’ you can drape wide bands of crepe paper from the ceiling to the walls — no need to buy or make actual tents. We’d love if you could share photos with us of the party afterwards! What a beautiful party!! I love all the gold and light pieces. Thank you for linking up to Party Time and we hope to see you again next week! Hi Jacqui! Thanks for stopping by. We’re happy to visit you on Party Time!